For many, a time trial conjures up visions of a Tour de France cyclist dressed in a unitard riding hunched over an aerodynamic bicycle—head down, teeth gnashed, and legs churning as fast as possible. Because every second counts in the final results, his heart rate is pegged, muscles burn, and the entirety of the trial is spent deep in the pain cave. Runners of all distances can utilize time trials as well. However, unlike cycling time trials in which the goal is to push one’s limit to outcompete others, running time trials are submaximal efforts used throughout a training cycle to test and build fitness. Popularized in the 1950s and 1960s by legendary running coach Arthur Lydiard, who led many runners to Olympic medals, these race rehearsals allow both coach and runner to discover training weaknesses and strengths. It’s important to understand what time trials (TTs) are and aren’t. TTs are not used to determine your maximum heart rate. You’ll work hard but shouldn’t redline. Again, TTs are not races. This is not the time to set a personal best. Perceived effort should fall between 7 and 9 on a 10-point scale. The goal is to run as even an effort and/or pace as possible throughout the length of the trial. Don’t increase speed/effort as the ‘finish line’ nears. Stay relaxed the entire way. Avoid starting too quickly and fading at the end. Performing TTs solo is optimal. You’ll better gauge effort and be less likely to ‘race’ without external influences. Choose a TT distance and course that best represent your goal race. Traditionally, runners preparing for races between 800 meters and 10 kilometers perform TTs on a track. The length of a TT should be equal to or slightly longer or shorter than your goal event. However, because the iRunFar audience races on all surfaces, terrain types, and over long distances, I suggest selecting a TT route and length that best mimics the bulk of your goal event’s course. Because TTs are meant to be tough efforts (but not all out), don’t create a TT route that is too long. Seek out a 6- to 12- mile snapshot of your race course to practice your TT. For example, runners training for the Western States 100 might choose to focus on the tough mid-race canyon descents and climbs in an 8-12 mile TT. Likewise, an athlete training for the White River 50 Mile could select a tough, mountainous 4- to 7- mile continuous climb on singletrack (like the ascents to Corral Pass or Sun Top) as their TT. Repeat the TT throughout the training cycle. Lydiard’s track athletes performed TTs 1 to 3 times/week during the peak of their training cycle. 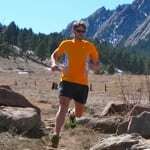 Because the majority of an ultrarunner’s training diet is volume oriented, you can be more conservative by spacing TTs out every 3 to 4 weeks. This monthly check-in will provide valuable feedback on your training progress. Document TT splits. Runners on a track can record laps. Runners on roads or in the woods can use fixed landmarks along their TT route. After several months of training you’ll acquire a healthy table of comparative data. Mimic race conditions. When possible, tackle your TT when the weather and course conditions are similar to those on race day. By including as many variables into your TT, you’ll be optimally rehearsed for the big day. TTs should be part of a complete workout. Warm up for 15 to 30 minutes (whatever you need to feel ready), complete the trial, and run very easy for at least 10 to 20 minutes as a cool down. Marathoners and ultrarunners may extend their cool down to incorporate more mileage. TT result: The early portion of the TT felt easy, but you struggled at the end. Remedy: Improve your stamina (the ability to efficiently grind out long distances) by slightly lengthening your next TT. During the training weeks between TTs, insert short tempo runs (3-4 miles at half-marathon effort/pace) and/or tempo intervals (5-7 x 1 mile at half-marathon effort/pace with 2-minute jogs between repeats) into your program. Goal: Finish strong and run with confidence during the second half of your event. TT result: The pace/effort was tough throughout. However, you managed your fatigue well and finished strong. Remedy: Develop your speed (your top-end running gear) by shortening your TT. Inject some fast VO2 max fartlek workouts (5-7 x 3 minutes at 5k-10k effort with 3-minute jogs between) and/or track intervals (10-12 x 400 meters at 5k pace with 2-minute jogs between) into your program. Goal: Feel smooth and struggle less with pace and effort. TT result: You struggled the whole way. Remedy: Take a rest day or two before your next TT. Make the TT more sustainable by decreasing effort, pace, and distance. Goal: Learn patience and better gauge your current fitness level. TT result: The entire TT felt very comfortable. Remedy: Increase your effort slightly during your next TT. Run closer to the 9 effort level rather than the 7 effort level. Goal: Capitalize on your strengths and be more aggressive. Time trials are a tool in your training arsenal that not only bring both strengths and weaknesses front and center, but also help you manage and overcome those areas that need work. By interspersing these workouts throughout your program, you’ll build race-day confidence and have a clearer understanding of your training needs. Do you do time trials in your training to help you get fit or be better prepared to race? If so, can you share examples of your routes and workouts? How do you plan a time-trial route? What features of the terrain do you incorporate and why? Champions Everywhere Staff. “Time Trial.” Champions Everywhere, 6 Oct. 2011, www.championseverywhere.com/time-trial-test-race/. Lydiard, Arthur. “Arthur Lydiard’s Athletic Training.” Www.fitnessports.com, Fitness Sports, www.fitnesssports.com/lyd_clinic_guide/Arthur%20Lydiard.pdf. Well written advice from You. Yes, I agree that running a time trial on a specific section of a course is excellent and it is important to include a warmup and cooldown. I have discovered that running these time trials on the most vertical section of a given course is excellent. If We can’t run on the specific course, It’s great to find some similar trail and vertical gain to keep the motivation high.